Triplet supercurrents in multilayer ferromagnetic Josephson junctions with misaligned magnetization survive longer barrier thicknesses when compared with singlet supercurrents. The distinctive feature of triplet supercurrents is the scaling of the characteristic voltage of the junction with increasing ferromagnetic barrier thickness – an algebraic decay in contrast to an exponential decay for singlet supercurrents. Although the static properties of these junctions have been extensively studied, the dynamic characteristics remain largely unexplored. 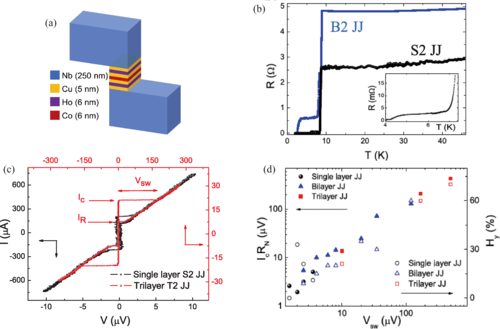 Here we report a comprehensive electrodynamic characterization of multilayer ferromagnetic Josephson junctions composed of Co and Ho. By measuring the temperature-dependent current-voltage characteristics and the switching current distributions down to 0.3 K, we show that phase dynamics of junctions with triplet supercurrents exhibits long (in terms of proximity) junction behavior and moderately damped dynamics with renormalized capacitance and resistance. This unconventional behavior possibly provides a different way to dynamically detect triplets. Our results show that new theoretical models are required to fully understand the phase dynamics of triplet Josephson junctions for applications in superconducting spintronics.